By the time December is here, most European cities are busy organizing Christmas Markets where visitors come to drink hot mulled wine in order to warm up. This is when the climate of Canary Islands starts to really differentiate itself from the rest of European destinations. Although the Canary Islands are not tropical islands, they do enjoy a mild climate all year round and in December you can still sunbathe in Fuerteventura on most days. Of course that the temperatures won't be as high as during the summer months, but while most other places in Europe are experiencing their first snow of the season, Fuerteventura still enjoys temperatures around 20°C during the daytime. 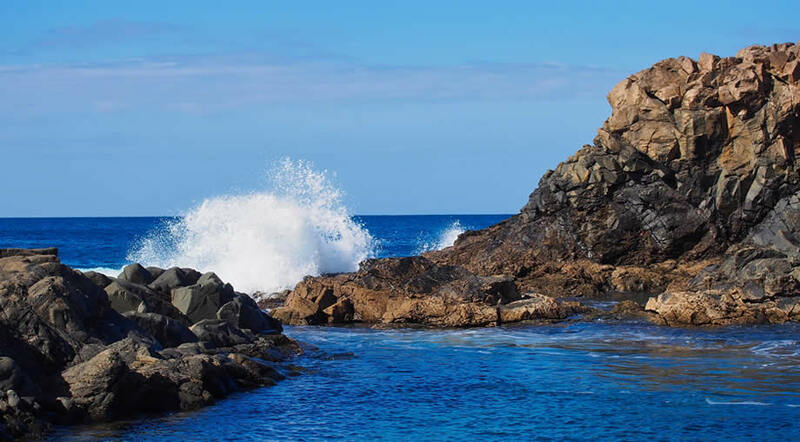 The truth is that December is officially the wettest month in Fuerteventura. But even so, with December being the rainiest month of the year, Fuerteventura sees way less precipitation and overall rainy days than London on its driest month. So while the possibility of rain is considerably higher than in summer (3 to 4 days of rain in December, as opposed to virtually 0 rainy days in in July or August), when you will compare the forecast in Fuerteventura with the weather forecast back home, I think that you will not regret choosing it as a destination for getting a bit of winter sun in Europe. December is considered as high season in Fuerteventura, as many people are looking to spend their holidays somewhere warm. Christmas in Fuerteventura is a great choice if you are looking for a warm and sunny place, where there's a a high chance that you'll be able to spend Christmas day at the beach in your bikinis and flip-flops. The average high temperature in December in Fuerteventura is around 22°C, while at night you can expect temperatures of around 16°C. While it's not what you could call summer hot, the weather will be warm enough to sunbathe when the sun is out. The highest temperature ever recorded in Fuerteventura in December (at the Airport station) was of 29.5°C and the lowest was of 9°C. While there are not great differences in temperature between resorts in Fuerteventura, during the winter season the south does feel warmer than the north and also get less clouds. This is some typical for all the Canary Islands. December is the rainiest month of the year in Fuerteventura, with around3 to 4 wet days and an average rainfall of 26mm. The average rainfall in December in London is more than double that amount, so with its temperatures around the 20°C mark and slimmer chances for rain, it is easy to understand why many people decide to spend their winter holidays in Fuerteventura. Fuerteventura gets an average of 6 hours of sunshine per day in December. Like we previously said, the south is less cloudy than the north, but wherever you choose to spend your holiday, you will still get a good amount of sun, enough to go back home with a bit more colour in your cheeks than when you came here. Can you swim in Fuerteventura in December? With an average of 19.8°C / 67.6°F, the water temperature has dropped below 20°C in most places, so it will probably be too cold for most people to swim comfortably. We recommend to book a place with a heated pool during your holiday in Fuerteventura in the winter season. December is the start of the festive season and the towns and resorts in Fuerteventura are all decorated for the Christmas holiday. It may feel strange at first to see Christmas lights and decorations when the sun is shining all day long and you are in a T-shirt and shorts, but you'll get used to it fast (and appreciated it). For December we recommend that you combine your moments of relaxation with day trips around the island, in order to see how different places are celebrating at this time of year. The big cruise ships start to arrive in Puerto del Rosario once the winter season starts. The city is filled with tourists, roaming around its streets and hopping from bar to bar, while enjoying the nice weather. It is also a good place to visit if you want to do some Christmas shopping at Centro Comercial Las Rotondas. Winter is probably the best season for hiking, on clear days when the sun is shining, because this way you can enjoy the good weather without having to worry about the high temperatures. Pico de la Zarza is the highest point in Fuerteventura and the trail there has no places where you can hide in the shade, which is why we recommend that you do the hike on a day when the weather is not too hot. The month of December is filled with events all over Fuerteventura and with all the decorations around, it is truly a festive time to visit the island. The entire month of December is filled with different events in anticipation of Christmas. There are many events for local children and also religious events, but there are also many parties organized by different bars and restaurants. Lots of restaurants will have special menus for Christmas and you may need to reserve in advance if you have a favourite place, as many of these places get booked months in advance. (see also a list of places in Caleta de Fuste for Christmas). All towns and resorts in Fuerteventura will celebrate the New Year with a big public party organized by the City Council. There is music and dancing and of course fireworks - largest parties are in Corralejo, Puerto del Rosario, Caleta de Fuste and Morro Jable.